It seems like we have been seeing neons as the nail trend this summer, with every major brand releasing a neon collection, and like with almost all trends, I embrace it early on, and then get a little tired of it as the season wears on. That's why when I saw the press release for Jessica's Gelato Mio! collection, it was a breath of fresh air. Banana Peel - light banana-pudding yellow. As I've mentioned several times, I have really fallen in love with yellows over the past few months, and while I think I prefer brighter yellows on my skintone, I really like Banana Peel. And I'm not sure if you can describe a nail polish as "fluffy", but that's the word that came to mind while I was swatching and reviewing this polish. 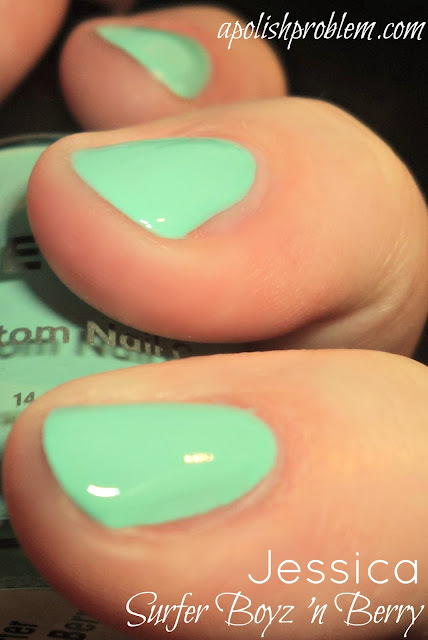 It's so light and airy, and like all of these polishes, perfect for summer. Barely Blueberry - light blue. It seems like I have been searching for the perfect sky blue for years with no luck. Then over the last few months, I find three that I love... Julep Jessica, Deborah Lippmann Let's Hear it for the Boy, and this one. Honestly, I would have a hard time choosing a favorite between the three, but if Juleps are out of your comfort zone because of bottle shape and expense, and the Lippmann is no longer available, then Barely Blueberry would be a fabulous option. It's is such a pretty sky blue, and unlike some blues I've tried along these same lines, it doesn't give me red-hands. Lime Cooler - light, kiwi green. Gorgeous light, yet bright green, that is pretty unique in my collection. If you are looking for a lime green that isn't too yellow, definitely check out Lime Cooler. Sometimes, like with certain pale blues, this type of color can my skin look red or dirty, but this one doesn't. It also had one of the thicker formulas. Strawberry Shake It - pale candy pink. To me, this one is color of strawberry taffy. Like Banana Peel, the color was almost "fluffy". It is a gorgeous shade, but I think for me, it's almost too light to work with my skin. It's still super pretty, and I think it would look fantastic on darker skin or tanned skin. Surfer Boyz 'n Berry - light aqua. This one is a great marriage of blue and green and reminds me of the color of the water in some exotically tropical locale. It seems similar to Zoya Wednesday, but I think Wednesday has more green in it. I love this kind of color, and Surfer Boyz 'n Berry is no exception. It's my favorite of the collection. It also has one of the the thicker formulas. 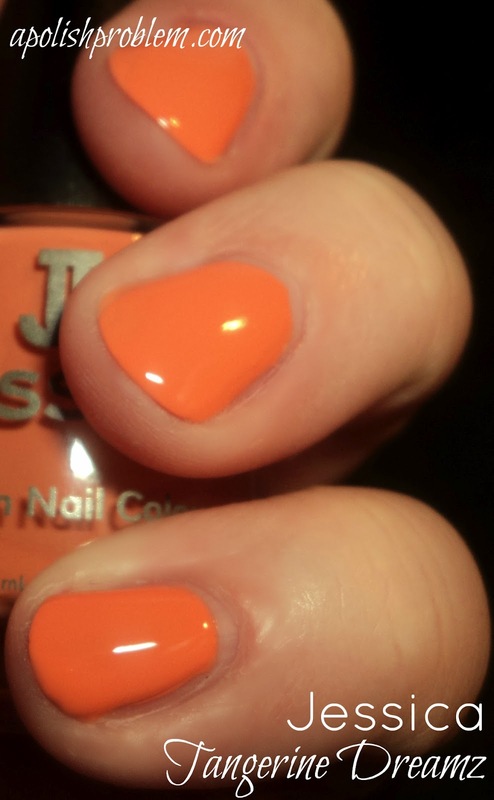 Tangerine Dreamz - light-toned, creamy, medium orange. This one is the color of orange push pops. It's also a lighter orange that works with my skintone. Looking at it makes me want ice cream or an Orange Julius. :P This one is one of the brighter shades in the collection. As you will notice, I didn't really say much about the formulas or the number of coats in my descriptions. That's because the formulas are very similar. 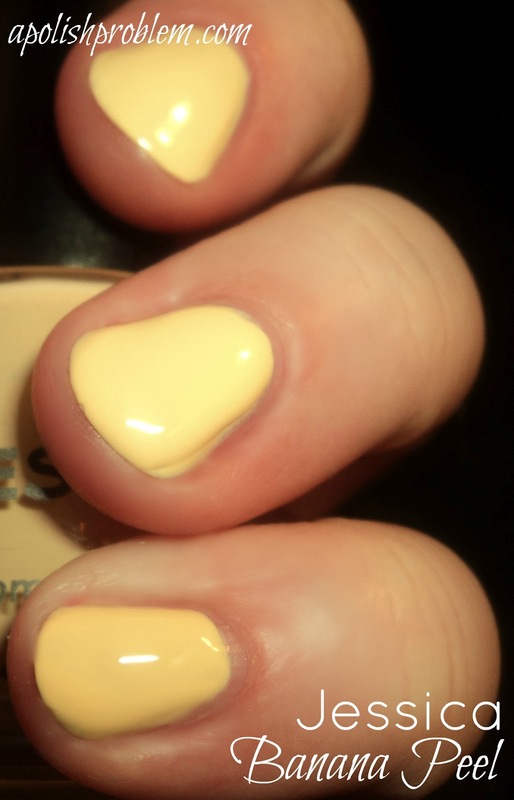 The lighter colors, Banana Peel, Barely Blueberry, and Strawberry Shake It, had the thinnest and streakiest formulas, but they were still manageable and opaque in 2 coats. The darker shades, Lime Cooler, Surfer Boyz 'n Berry, and Tangerine Dreamz, had thicker formulas and were two-coaters. As I said above, I think this is a perfect summer collection. My favorites is Surfer Boyz 'n Berry, but there isn't a one of them that I don't like. I would probably not pick up Strawberry Shake It, simply because it did look a little chalky on my, but it's still beautiful and if you have more olive in your skin, it would look super pretty. Jessica Gelato Mio! is currently available at Jessica Cosmetics' website. Jessica polishes retail for $7.50 a bottle. Jessica Gelato Mio! collection was sent to me for review. The above link links to Jessica Cosmetic's website and is not an affiliate link. If you posted a comment in this post and don't see it here, that is because that when I was moderating the comments, my hand slipped on the mouse and instead of clicking "publish", I clicked on "delete". I apologize. Please feel free to resubmit any comment. Thank you! what a beautiful collection! surf boyz n berry is my FAV!! I really like this collection but I'm loving Banana Peel.